To continue with my series on Historic Architecture in Minneapolis and St Paul, some of the most beautiful examples of fine craftsmanship can be found in Italianate homes. The Italianate style is reported to have begun in England as part of the Picturesque movement. Over the years, Italian Villas, as some call them, went from farmhouse informal to formal grandeur. Obviously, as the name infers, Italian architecture from ancient Rome led a helping hand to the popularization of key architectural details. There are many details in the design of Italianate that make it easily identifiable. One of the easiest is the heavy, large brackets that hang under the eaves. They are usually ornate and arranged singly or in pairs. Every home was built with at least two stories, and the style is predominately found in the Midwest and some in the Northeast. Another obvious feature is the square copula that sits atop the home. The roofs are usually low pitched. Unfortunately, copulas tend to be neglected and they begin to leak, so most Italianate homes no longer sport this eye catching feature. 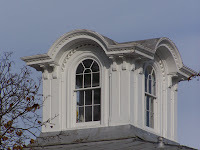 The cupola shown below is the only remaining one in Stillwater, which has numerous examples of the style. The decline of the style began with the panic of 1873, and once consumer confidence returned, new styles like the Queen Anne Victorian were becoming popular. I have put together a slide show of historic homes in Minneapolis, Saint Paul, Stillwater, Red Wing, and Lansing, Iowa, that are prime examples of Italianate architecture. Two details you will see throughout are the arched windows and the window hoods above each window. View the first post in this series on Second Empire architectural design.